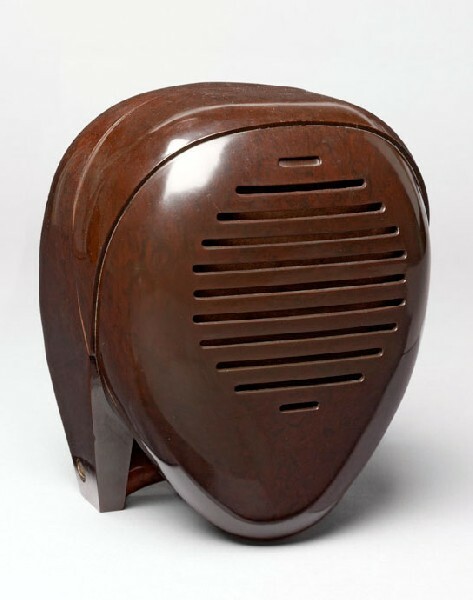 Radio Nurse by Isamu Noguchi, produced by Zenith in Bakelite, 1937, a radio transmitter for a nursery. 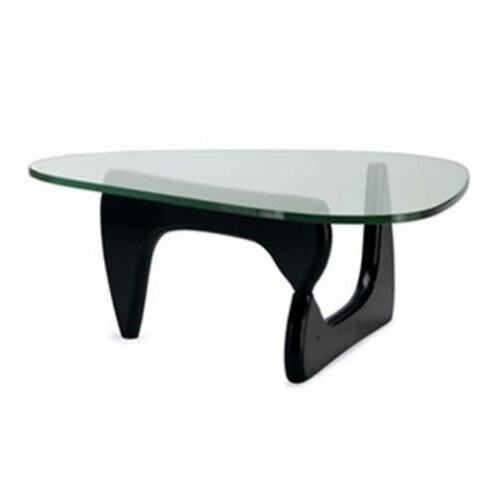 The Coffee Table, Designed by Isamu Noguchi in 1944, produced for the US market by Herman Miller since 1947, Materials: varnished solid wood base, 19 mm glass top with rounded edges. 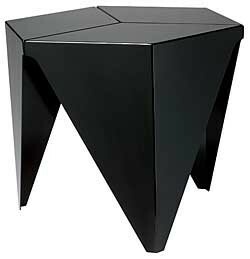 Prismatic Table By Isamu Noguchi, 1957, Materials: Coated sheet Aluminum / Dimensions: 15"H x 18"W x 18"D. This was the last piece of furniture that Noguchi designed. 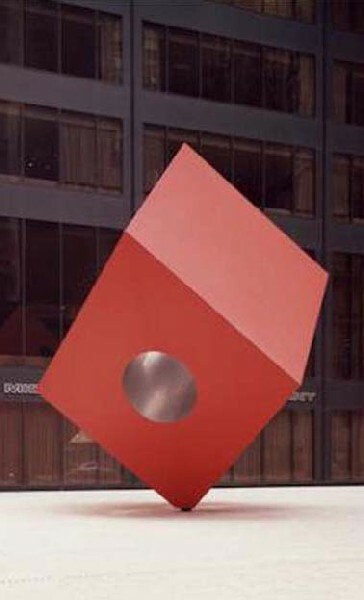 Red Cube, By Isamu Noguchi, 1968, red painted steel , New York, New York, +/- 30ft high, Not really a cube! A visceral connection between what is art and the best design has always been an intense inner quality radiating visually and materially resonating underscored by a aesthetic convergence of form and function. The overlap of elegance of function and beautiful form is due to great talent, lucky coincidence or probably a bit of both. This is most often translated by sculptural form. Great three dimrnsional design is almost always great sculpture. The sculptural form gives the functional design a visual eloquence, an elegant objectness. This great sculptural quality makes a statement of intrinsic value. This can be seen in the many products of Apple created by industrial designer Sir Jonathan Ive under the watchful eye of the late Steve Jobs. Ive in turn was influenced by master industrial designer Dieter Rams whose design principles included an aesthetic that reinforced function, attention to detail and quality of form. As one of the twentieth century’s most important and critically acclaimed sculptors and designers, Isamu Noguchi (1904–1988) spent his long and distinguished career involved in artistic and design creative innovation. Multifaceted, his work included sculpture, gardens, furniture, lighting, ceramics, architecture, and set designs. His mature work was at once subtle and bold, minimalist but often functional, traditional and yet modern. In everything he did, there was attention to detail. 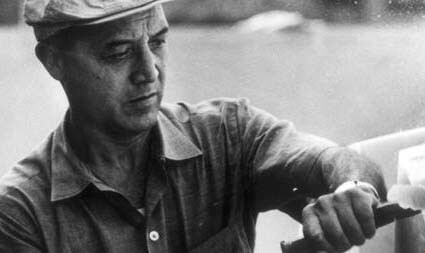 Noguchi was an internationalist who traveled and looked at the environment, structures and objects, both large and small, extensively throughout his life. During his later years, he maintained studios in both Japan and New York. As with his personal heritage, these two cultures gave tradition, nuance and energy to his work. 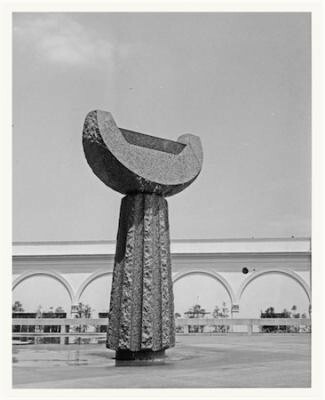 While traveling through Mexico, Noguchi first discovered the visual and quite physical impact of large-scale public works at temples and ruins. He was also greatly influenced by organic ceramics and tranquil gardens in Japan. He was impressed by subtlety of Chinese ink-brush techniques, and was inspired by the beauty and handling of marble in Italy. He creatively incorporated all of these impressions into his practice. His work utilized a wide range of materials. These included stainless steel, marble, cast iron, balsawood, bronze, aluminum, granite, and water. Great design as art can be seen in indigenous or "native" cultures throughout the world. Many 20th Century artists have been influenced by this. Beautiful artistic form is represented in the folk art of all native or first people's tribal objects. Perhaps the most influential to the design world have been the minimalist Zen Japanese designs of the previous four centuries and American Shaker furniture and accessories. Certainly, both through their elegant simplicity and aesthetically integrated objects and furniture walk the dual aesthetic path of art and design, sculptural functionalism. Scholars have compared the two geographically distant but aesthetically, if not similar, compatible forms. If not on purpose, for it is not clear that the artist actually studied Shaker design, Noguchi seems to personify and incorporate this east/west sensibility. 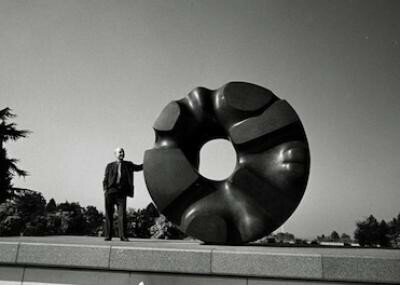 Isamu Noguchi was born in Los Angeles, California, to an American mother and a Japanese father. Noguchi lived in Japan until the age of thirteen when he moved to Indiana. While studying pre-med at Columbia University, he took evening sculpture classes with the sculptor Onorio Ruotolo. He soon left Columbia to become a sculptor. In 1926 Noguchi saw a New York exhibition of the sculpture of Constantin Brancusi’s that profoundly changed him. Previously, he had been more or less a traditional rather academic figurative artist. But with a Guggenheim Fellowship, Noguchi went to Paris, and from 1927 to 1929 worked in Brancusi’s studio as an apprentice. Inspired by the older artist’s reductive elegant forms, Noguchi turned to modernism translated into an abstraction. He began to incorporate into his always highly finished pieces an intrinsic lyrical (poetic) and emotional expressiveness shrouded in mystery. This became his aesthetic hallmark the rest of his career. 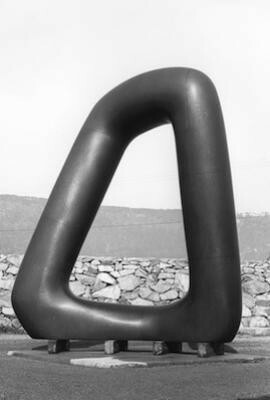 Noguchi’s work was not seriously recognized in the United States until 1938, when he completed a large-scale sculpture symbolizing the freedom of the press. The sculpture was commissioned for the Associated Press building in New York City's Rockefeller Center. This was the first Noguchi major sculpture commission. Following this the sculptor received numerous public works worldwide. These ranged from playgrounds to public plazas, gardens to fountains. These all reflected his notion of the intrinsic social significance sculpture. Noguchi looked at public commissions as civic design projects. 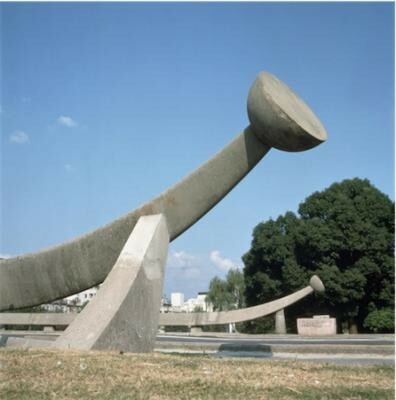 Therefore, to him each of his sculptural public art elements was a functional form. In most cases, he worked with architects on his major commissions. Noguchi viewed his pieces as not just adornments to major structures and projects but as a collaboration between the artist and the architect. An interesting example of this is Noguchi's stunning railing for architect Kenso Tange's Hiroshima Memorial Peace Bridge that was completed in 1953. This is a true design/art collaboration based upon ancient ISE Japanese cultural forms. Early in his career, Noguchi did not belong to any particular movement, but collaborated with artists working in a range of different mediums and schools. 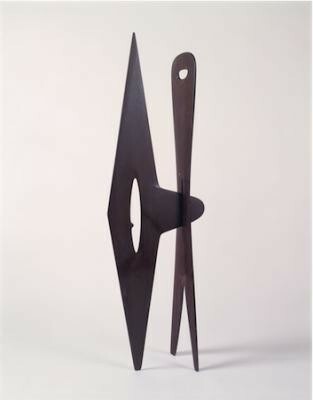 Yet after, the late 1930s, his work took on a Noguchi style. Starting in 1935, he created stage sets for the dancer/choreographer Martha Graham. This was a lifelong collaboration, as well as for dancers/choreographers Merce Cunningham, Erick Hawkins, and George Balanchine and composer John Cage. In the 1960s he began working with stone carver Masatoshi Izumi on the island of Shikoku, Japan. This collaboration continued for the rest of his life. From 1960 to 1966 he worked on a playground design with the architect Louis Kahn. Open to opportunity, he accepted commissions for products to be mass produced. Notably, in 1937 he designed an iconic Bakelite nursery intercom, Radio Nurse, for the Zenith Radio Corporation. This design is considered one of the great pieces of American Streamline design, a form of Art Deco produced by industrial designers in the United States from the late 1920s through the 30s. In 1947, his biomorphic glass-topped Coffee Table was produced by Herman Miller. This still quite popular coffee table along with his designs for rice paper and metal Akari Light Sculptures (1951) are considered icons of MidCentury Modern Design. They are equal in prestige to the works of the greatest furniture designers of the period including Charles and Ray Eames, George Nelson and Harry Bertoia. Noguchi himself described his Coffee Table as his best furniture design. This was probably because it was similar to his bronze and marble sculptures of the time. Here, he translated the biomorphic formal language into a elegant functional piece of sculptural furniture. There was a pleasing sculptural balance that was achieved with glass tabletop resting on two identical wooden elements placed at right angles. Though quite well known in the art world and in the furniture/industrial design world, strangely Noguchi’s first retrospective in the United States was in 1968, at the Whitney Museum of American Art, in New York City. In 1986, he represented the United States at the Venice Biennale. Over his career, Noguchi received many awards and accolades. In 1985 Noguchi opened The Isamu Noguchi Garden Museum, now known as The Noguchi Museum, in Long Island City, New York. This personal museum was completely designed by the artist. It is his last creative statement about public spaces. Located in a 1920s industrial building across the street from his longtime studio, the museum has an outdoor sculpture garden with galleries displaying Noguchi’s history and work. If any adjective could be applied to Isamu Noguchi's major art and design works, it would be "serene." 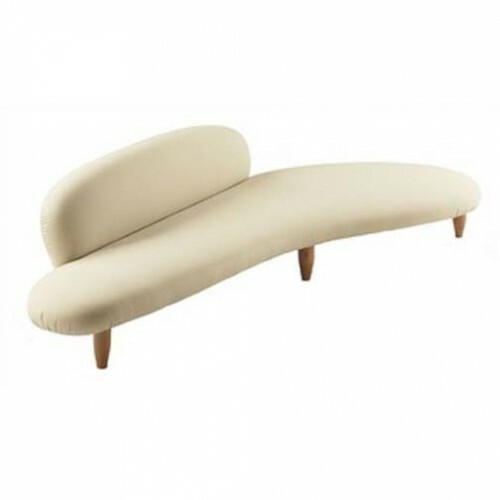 Where great design and great art intertwine, there is a there there in terms of Noguchi's work. All inherently have a physicality as well as eloquent visceral presence. Noguchi's works have a quietly eloquent visual poetry. "An informative, wonderful article. Great reminder of how much we need this kind of art ... serenity..."